While depression is primarily believed by the general public to affect adults, the American Academy of Child & Adolescent Psychiatry reports that nearly five perfect of children and adolescents suffer from clinical depression. 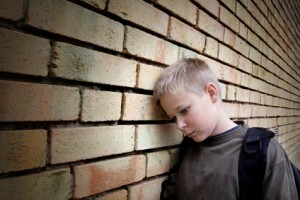 Because children experience varied behaviors from one stage of development to the next, determining if a child is suffering from depression or simply going through a “phase” can be difficult; however, depression in children identification is possible if you understand the warning signs and symptoms of childhood depression. While childhood depression symptoms can greatly vary from those found in adults, there are several key symptoms parents should identify if they believe their child is suffering from this mental disorder. Although all children encounter moments of anger or irritability, if your child is experiencing a significant increase in anger or if he is angered by circumstances that typically do not evoke such anger he may be suffering from depression. If your child isolates himself from friends, pretends to be sick to avoid going to school or spends the bulk of his free time alone when he typically enjoys social activities he may be experiencing depression. A child that strays from his typical eating or sleeping patterns may be encountering mental strain or depression. Although some children naturally have a weak concentration, if your child is having a difficult time concentrating in school, at home or in activities he once found enjoyable it is likely he is suffering from a form of depression or anxiety. A child that experiences frequent bouts of crying or sadness over small or large scenarios is likely experiencing a deeper emotional conflict within his mind. If your child cries easily or is not himself, consult with his physician. The pressures children and adolescents face in school, social activities and at home can result in an attempt to hide his feelings of sadness, fatigue and crying; however, most children are unable to hide depression symptoms such as mood swings, impulsivity and irritability. The suppression of certain emotions and exasperation of others often leads to a misdiagnosis of ADHD. Even if a child is not suppressing his feelings, certain symptoms are similar to ADHD and if the child is not carefully examined by a psychologist it is easy for him to be placed on ADHD medications when he truly needs depression treatment. Although successful suicide attempts in children are not as common as in adults, it is not unheard of. According to a 2007 study published by the National Institute of Mental Health, 0.9 per 100,000 children aged 10 to 14 will commit suicide; however, this number rises to 6.9 per 100,000 for adolescents aged 15 to 19. As a parent or caregiver for a child with depression it is important to recognize the warning signs of suicide to help displace these thoughts and prevent the child from following-through with his self-destructive impulses. A child who writes or talks about suicide, dying or death may be experience internal feelings or interest in suicide. A child who engages in behavior that is harmful to his mental stability or physical body may be at risk for suicidal behavior. As with adults, the causes and risk factors of depression in children can greatly vary depending on the economic status of the family, social standing and heredity. A study published in the July 1999 issue of “Psychological Review” found a direct link between a mother with depression and her child experiencing depression symptoms. The study also found a connection between the father’s health and personal involvement with the child in regards of depression onset. Researchers have found that a child who thinks negatively is more likely to experience clinical depression as their outlook and interpretation of life is cast in a depressive context. This pessimistic mindset promotes the development of depression symptoms due to the negatively biased view of the world. Children can be genetically pre-disposed to depression if this mental illness runs in the family. Like adults, depression can be triggered due to the genetic makeup passed down through generations. Studies have found children with parents who are clinically depressed are more likely to develop depression symptoms in childhood than children with non-depressed parents or family members. Bipolar disorder, also referred to as manic-depressive illness, affects nearly one-third of the 3.4 million children who are diagnosed with clinical depression, according to the American Academy of Child and Adolescent Psychiatry. Much like depression in children, bipolar disorder symptoms differ than symptoms found in adults. The most common symptoms of manic depression in children includes: rapidly altering moods, explosive moments of destructive rage, inappropriate sexual behavior and the belief that they can defy the “laws of logic,” such as being able to fly or breath underwater. Treatment options for children with depression are handled in a strikingly similar fashion as adults. Typically, a comprehensive treatment plan includes individual and family therapy, the inclusion of antidepressant medications or a combination of both antidepressants and talk therapy. Therapy such as cognitive behavioral therapy and interpersonal psychotherapy are shown to be quite effective in reducing the severity of depression in children, according to the American Academy of Child & Adolescent Psychiatry. Although certain forms of mild depression may clear-up on its own, when a child suffers from depression is best to seek out treatment to prevent further complications. Perhaps one of the most notable risks of not treating depression in children is the risk of suicidal behavior. Other risks include social impairments and problems at home, school or with their close friends. The American Psychiatric Association found that children who are not treated for their depression are at an increased risk for developing eating disorders, substance abuse problems as well as teen pregnancy. It is critical that if you think your child has depression that he or she gets help as soon as possible. The earlier treatment is started, the greater the likelihood of success. Is Depression Genetic – Does Depression Run in Families?